I’ve decided to try something new…at least new for me. At the start of 2015, I set a goal to write 4 books before the end of the year. Well, it’s time to start book #4. But this time around, I don’t want to do it alone. I get asked questions about the writing process all the time. I tell everyone it’s a marathon, with highs and lows, successes and failures. Some days, I can’t wait to get to my laptop. Others, I’d rather give Brazilian waxes to gorillas than sit down and write even one page. The rest of this year is going to be tough. Aside from all the holidays, there’s a ton of personal stuff lying in wait for me and my family. We can see it all written down on our calendar for October and November. So, writing my new book for Samhain will be a challenge and a half. This time around, I want you to follow me every step of the way. No, I don’t have room in my house for everyone. But thanks to Twitter, Facebook and this blog, I have plenty of ways to share the process. You’ll get to see the good, the bad and the ugly. Each day will be different. I’ll share pictures of where I wrote, word count for the day, how I felt, what stumped me, what worked – all the things that go into getting to The End. Twitter will be my daily stop. You can check it out by following the hashtag #HunterWrites. I’ll stick larger posts on Facebook and this blog from time to time as well. Feel free to send me questions along the way, words of encouragement, your own tips, hell, whatever comes to mind. When it’s all said and done, you’ll know exactly how I managed to write my fourth book this year over the next few months. The name of the book will be WE ARE ALWAYS WATCHING. Now, you’ll always be watching me. 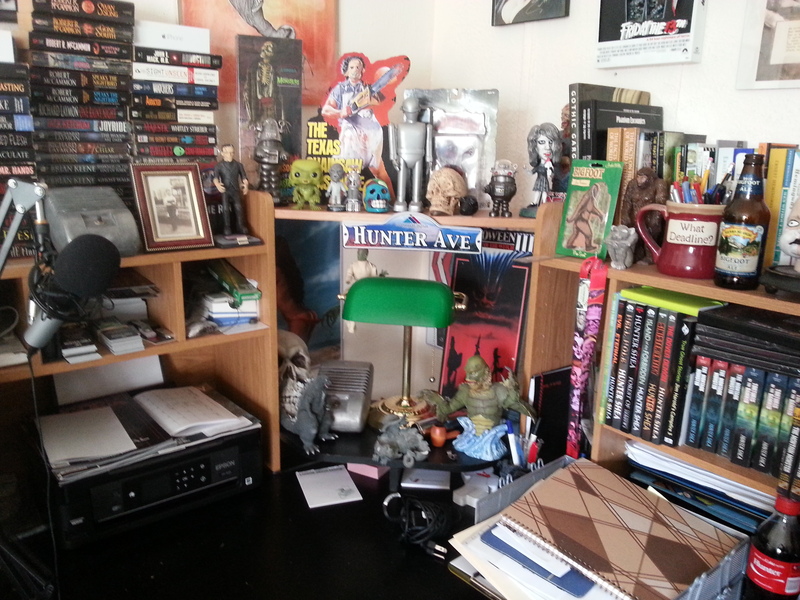 I started it off in my little writer’s lair, pictured below. Before it’s finished, I suspect I’ll have written parts all over the place.